Replaces The Bane, new skin, new special effect and no annoying screaming. 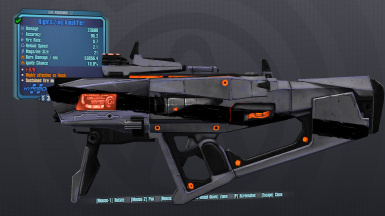 To use this mod you first have to Hex edit your BL2.exe, I reccomend using BLCMM for that. Use the import mod function of BLCMM to get this mod working alongside your other mods. - Always has 21 bullets in the clip and depletes your shield completely while increasing the weapons damage by 12.5% of the shields max capacity. Also has the amp shield fx on every shot.